← Ultimate Girl Power Week! I designed this zipper wristlet pouch to tie in to Indie Untangled’s Knitting Our National Parks project, which will offer four special yarns in 2017, each by a different indie dyer. I will offer an exclusive yarny accessory, available for purchase separately, to coincide with the release of each yarn installment (June, August, October, December). Each offering in this collection will be available for pre-order for two weeks, or until the limited edition of 24 items is sold out, whichever comes first. All items in the collection will feature this wonderful fabric, part of Amy Peppler Adams’s Soda Nation collection, on the exterior. 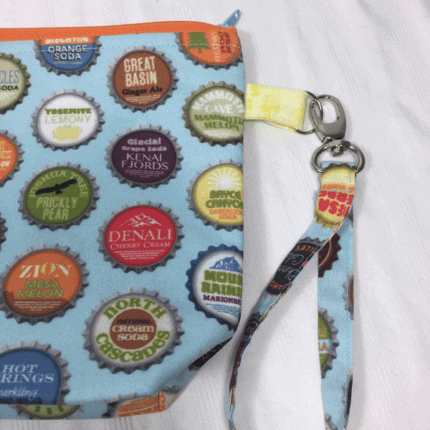 The June zipper bags have cheerful Soda Pop Top “Sunshine” lining. Subsequent installments of the project will each feature a different complementary lining, so items will be coordinated but not matchy-matchy. For openers, here is one of my most popular bag styles, offered to coincide with Backyard Fiberworks eye-poppingly beautiful colorway North Cascades Night. 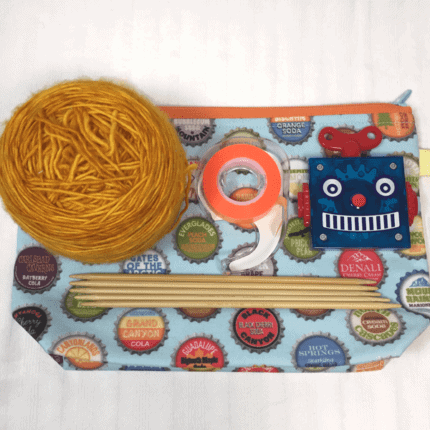 If you’re going to pop for one new project bag this month, I think you’ll love this one! 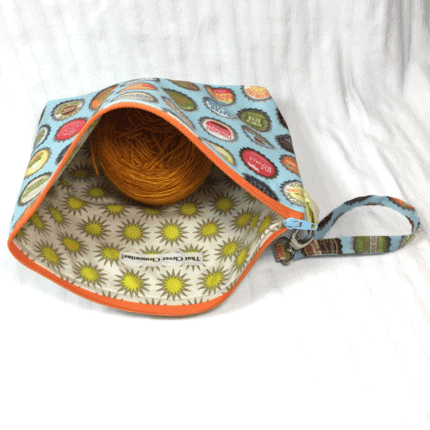 This is a great one-skein project bag, but it’s also sized just right as a “grab-and-go” wristlet purse! It will hold some cash, your phone, keys, lipgloss, tissues, and a bit more. Pull it out of your tote bag, put on your shades, put the top down on the convertible, and let’s blow this pop stand! At just $22 a pop, you’ll get a lot of use from this handy bag, it’s perfect for summer excursions thru the parks, and everywhere. • This is a Limited Edition of 24 bags, available for pre-order starting June 16, 2017. • Orders will ship on or before July 31. Details and ordering info at ThatCleverClementine.com. PLEASE NOTE: As luck would have it, my website is experiencing a last-minute PayPal snafu, and the shopping cart will not allow you to add an item, or check out. To order, please go to my online shop and read the listing details, look at the pix, and then use the contact form (at the bottom of the shop page) to reserve your bag. Follow the instructions on the contact form page, and you will receive a PayPal invoice; payment of the invoice will reserve your place in the queue. Thanks for understanding the need for this last minute solution!